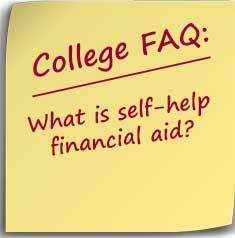 Self-help financial aid is aid that the student earns through work or is required to pay back. Student loans and work-study are both self-help aid. Many colleges build their financial aid award starting with self-help aid. Problems can occur when the institution doesn’t meet the student’s full-financial need, often referred to as “gapping.” For example, if a student is awarded a work-study job but still has unmet need, it’s going to be difficult to get a second job to make up the gap. More than likely, the student or parents will have to take out a loan to pay for the amount not cover by financial aid. This is actually something I have experience with. As a freshman, I was awarded a partial Pell Grant, partial federal loan, and a work-study job. The work-study job, which was federally funded, was in place of a full federal loan. However, because of a changing financial situation in my family, I was going to need the full value of the loan and work part-time as well. Therefore, I turned down the work-study job so that I could get the full loan and still find a part-time job. Also, the student contribution is separate from money awarded through a work-study job. Students are expected to earn their contribution during the summer. Given the lack of consistency among financial aid award letters, it is important that families realize that anything listed as self-help aid is, for all intents and purposes, money that the student will have to come up with. Families should compare the cost of attendance based on the self-help aid plus any unmet need rather than the amount of merit, grant, or scholarship aid awarded.